On our trip to India, we witnessed the unique culture through glimpses of bridal beauty, delicious food, holy rivers, and stunning architecture. 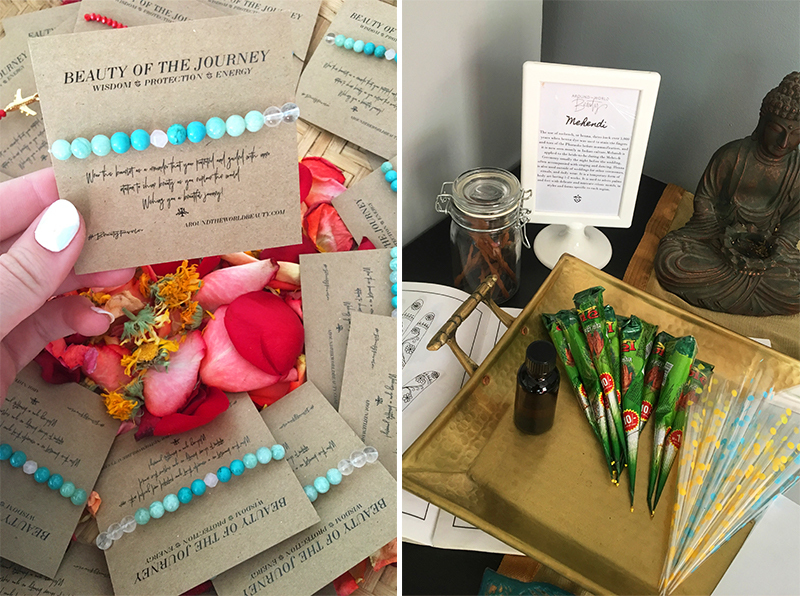 After such a life-changing experience, we knew we had to create a workshop to share Indian Beauty with others. In came our Indian Beauty Workshop in March. 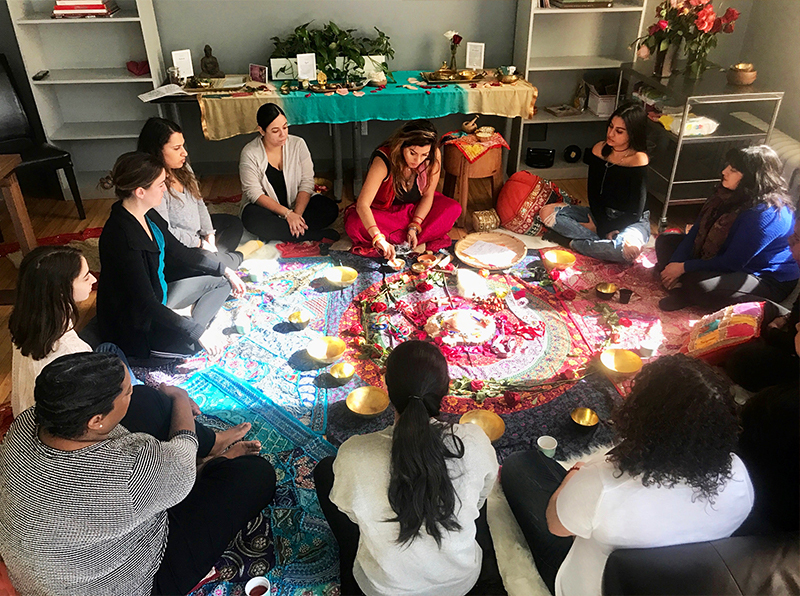 The event was graced by a handful of wonderful women who joined our circle in the sacred Around the World Beauty Space. We began with a blessing and meditation after sharing what beauty means to each and every one of us. 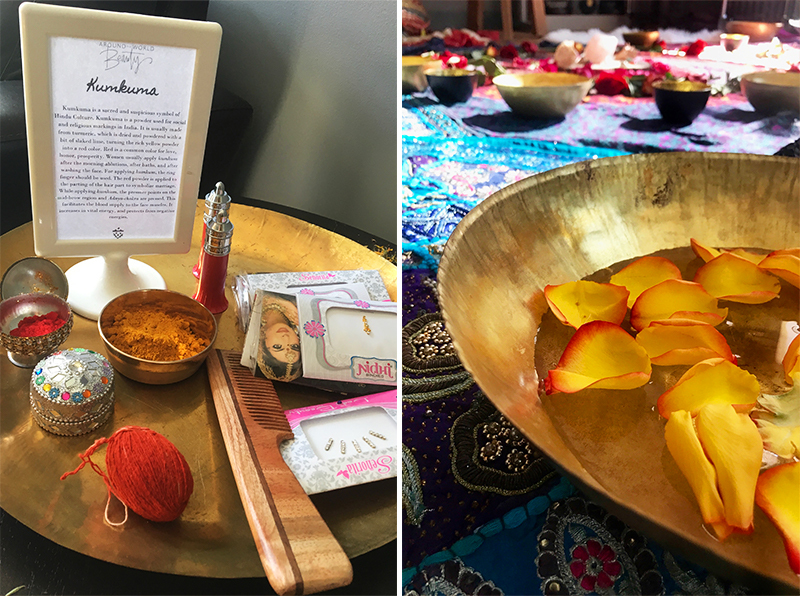 After the opening rituals, we explored some of our favorite beauty traditions from the Indian culture. Stephanie handed out some bindhis from her travels in India to give to everyone, and each woman adorned one another with a kumkuma mark and/or bindhi on her third eye. Kumkum is a sacred and suspicious symbol of Hindu Culture used for social and religious markings in India. It is usually made from turmeric, which is dried and powdered with a bit of slaked lime, turning the rich yellow powder into a red color. Red is a common color for love, honor, prosperity. Women usually apply kumkum after the morning ablutions, after baths, and after washing the face. For applying kumkum, the ring finger should be used. The red powder is applied to the parting of the hair part to symbolize marriage. While applying kumkum, the pressure points on the mid-brow region and Adnya-chakra are pressed. This facilitates the blood supply to the face muscles. It increases in vital energy, and protects from negative energies. We learned how Kajal eyeliner is deeply rooted in Indian history, and practiced the interesting method of creating it. Kajal, or kohl, is a deep black powder that has been used for centuries. The ancient Egyptians used it to adorn the eyes and protect from the harsh rays of the sun. It has also been used as an ointment for eye infections, and it is also applied to infants as a protecting agent to ward off evil spirits. Kajal has transcended from a purely medicinal product to also become a cosmetic staple of Indian Beauty. In India, Kajal is used as an eyeliner to thickly line the eyes, making them stand out beautifully. It creates a dramatic, goddess-like beauty. Kohl is created by many different cultures. The methods of making it all vary, but it is essentially a soot that is made from burning natural oils. In India, it is made by burning a muslin cloth in ghee within a brass vessel, and collecting the soot residue. It was a bit difficult to execute in person, but we managed to create the black kajal powder using the same technique that women have been using around the world for centuries. 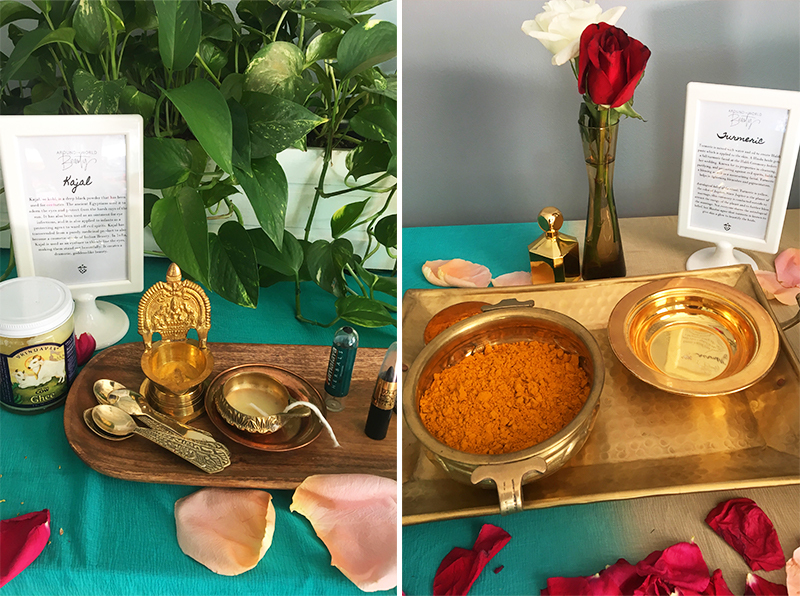 Inspired by Indian pre-wedding rituals, we created a turmeric face mask to recreate the Haldi ceremony. Turmeric is mixed with water and oil to create Haldi paste which is applied to the skin. 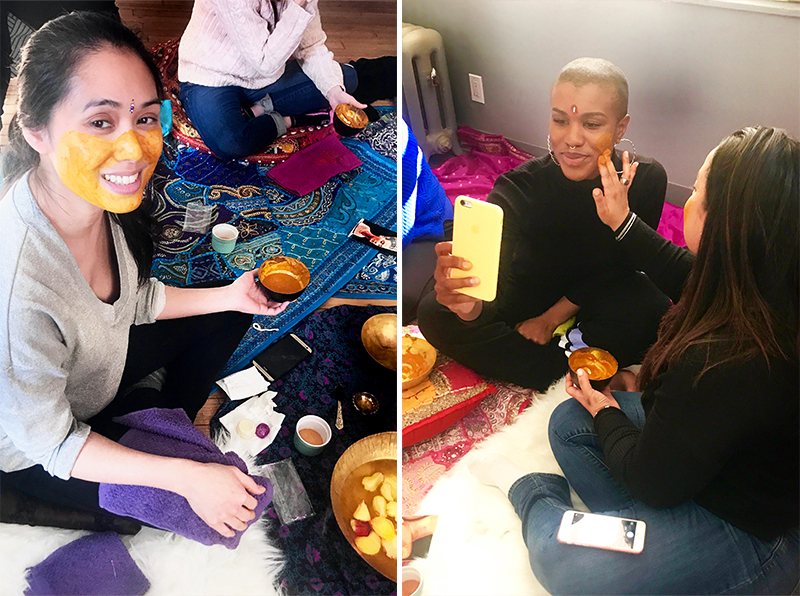 A Hindu bride gets a full turmeric facial at the Haldi Ceremony before her wedding. Known for its properties in cleansing, purifying, and protecting against evil spirits, haldi is a blessing as well as a moisturizing facial. Turmeric helps in lightening blemishes and pigmentation. Astrological belief of the ritual: Turmeric is yellow, the color of Jupiter. 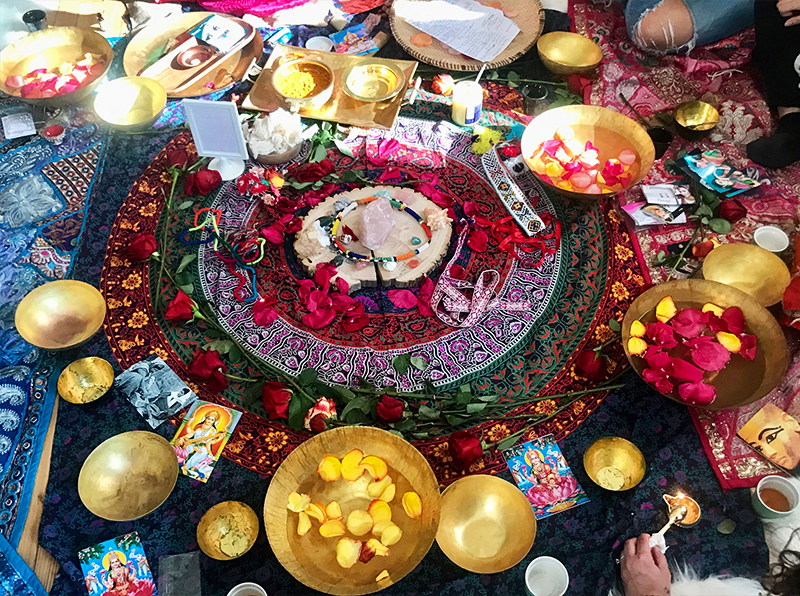 Since Jupiter is the planet of marriage, this ceremony is conducted outside to attract the energy of the planet and to further bless the marriage. Not everyone shares the astrological belief, but Hindus agree that turmeric is known to give skin a glow to beautify the bride. After washing the mask off with rose water, we explored perhaps the most well-known ancient beauty ritual in India. Henna is much more than just our favorite kind of temporary tattoo, each line and design has significance. We created henna paste from scratch and used it to create beautiful, intricate designs that would last on the skin for weeks after the workshop. The use of mehendi, or henna, dates back over 5,000 years when henna dye was used to stain the fingers and toes of the Pharaohs before mummification, and it is now seen mostly in Indian culture. Mehendi is applied to the bride-to-be during the Mehendi Ceremony usually the night before the wedding, often accompanied with singing and dancing. Henna is also used outside of weddings for other ceremonies, rituals, and daily wear. It is a temporary form of body art lasting 1-2 weeks. It is used to adorn palms and feet with delicate and intricate ethnic motifs, in styles and forms specific to each region. We each took time to decorate one another with beautiful henna designs, and each woman in our circle had their own henna cone to take home. The workshop concluded with another beauty meditation, and guests stayed to take a look at all of the beauty artifacts around the room. Our favorite piece of jewelry is our Beauty Bracelet that we sourced in India from our friends at Om Parkash artisan bead shop in Hardiwar. These bracelets are made in India with powerful beads that each have a meaning. Every bracelet also gives back to a woman in need. Each woman left the workshop feeling more beautiful than she did when she came in. If this sounds fun to you, too, join us in person to re-create and experience the beauty of other cultures, we’d love to have you. Here is a link to our upcoming workshops inspired by the worlds #BeautyCulture. Our crystal bracelets both beautiful and useful, as they provide protection on one’s travels.